Description: M-380 is a water-based corrosion inhibitor that is designed to be used with carboxylated acrylic or styrene-acrylic latices. 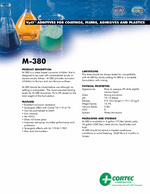 M-380 provides corrosion inhibition to ferrous and non-ferrous surfaces. M-380 should be mixed before use although no settling is anticipated. The recommended starting levels for M-380 should be 1% to 3% based on the total weight of the formulation. Package: 5 gallon (19 liter) plastic pails, 55 gallon (208 liter) metal drums,liquid totes and bulk. FEATURED IN: Helping Prevent Corrosion One Molecule at a Time Featured in European Coatings Magazine!